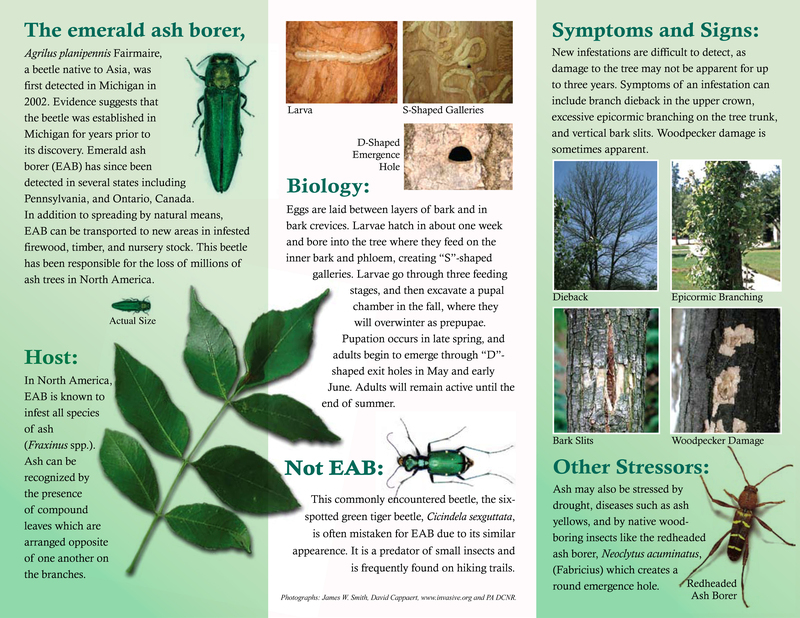 You probably haven’t seen the Emerald Ash Borer, Agrilus planipennis. Yet. This beetle from Asia was first discovered in this country in 2002 in a suburb of Detroit, Michigan and currently populates about 5,000 square miles in various states. The closest to us is Virginia, Maryland, and two counties in Western Pennsylvania: Allegheny and Butler. Yesterday, some of us at the Scott Arboretum were shown a presentation by Ron Kushner of Albrecht’s Nursery about the destruction that this insect has caused thus far. It’s pretty incredible. The Emerald Ash Borer lives and completes its life cycle only on the genus Fraxinus. The beetle mates in early summer and has a life span of only about three weeks. The females lay their eggs in the bark of the tree. The juveniles emerge and tunnel in the cambium layer in an “S” shape throughout the summer and fall. This is where the real destruction takes place. The boring of this “S” shape strangles the tree and stops the flow of water and nutrients. The adults emerge from April through June through a “D” shaped hole in the bark and will eat around the perimeter of the leaves. They can kill the host ash tree within 2 years. Street trees all over Michigan and elsewhere are dying and being taken down every day. Streets once lined with beautiful ash trees that provided shade for people and habitat for animals are now gone, leaving barren, sun-bleached landscapes. Because this insect reproduces so profusely and has moved around on firewood and nursery stock, all ash trees in this country are at a certain level of risk. Control and management of this insect has been extremely difficult. 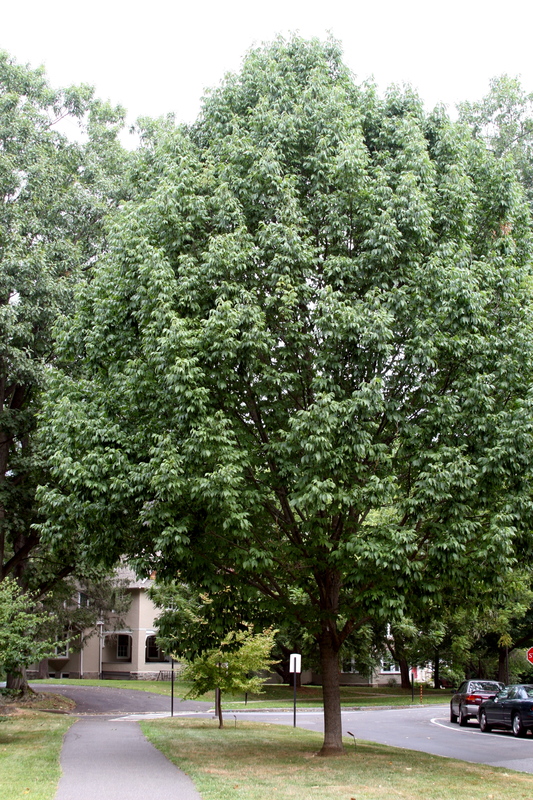 According to Doug Tallamy’s research, up to 1,500 different kinds of insects can live in one oak tree, so people are hesitant to begin spraying ash trees because many other kinds of insects would die in addition to the Emerald Ash Borer. What can you do as a gardener in southeastern Pennsylvania? Be on the lookout for this insect. Know your ash trees and monitor them by looking for leave damage and “D” shaped holes in the bark. Report a sighting immediately to badbug@state.pa.us. Do not transport firewood or buy ash trees from nurseries in infected areas. For more information, visit http://www.emeraldashborer.info/. If you are you interested in learning more about insects and their relationships to plants and animals, join Doug Tallamy for his lecture Gardening For Life on February 12th here at the Scott Arboretum. Thank for sharing this very important information with the public!